"This isn't a hero's journey. Chicago's resident comedy-practicing jerk, Joe, is unexpectedly transferred to small town Triumph, IL, home of the world's oldest curling club - and not much else. Thanks to a little tough love, the end of a bad relationship, strange encounters with Illinois' eccentrics and plenty of cheap beer, Joe becomes slightly more tolerable." 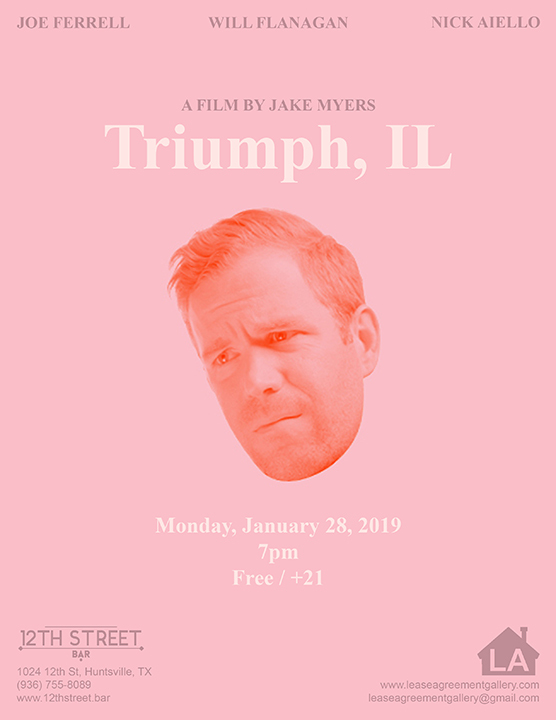 Truimph, IL is an 83-minute narrative film, by Illinois-based artist and filmmaker Jake Myers, presented as a screening in the 12th Street Screening Series. The 12th Street Screening Series is an ongoing series of short cinema and video works, curated by Lease Agreement, and presented at the 12th Street Bar. Lease Agreement is an artist-run and sometimes nomadic curatorial project by Adam Farcus. Currently based in Huntsville, Texas, the art programing continues in the tradition of alternative art spaces by organizing conceptually rigorous, engaging work for exhibitions, screenings, performances, and art events. Lease Agreement partners with galleries, organizations, and utilizes public spaces to bring contemporary art to viewers. Jake Myers was born in rural Illinois, raised in suburban Illinois, and resides in Chicago, Illinois. He likes teaching, playing volleyball, curling, and making movies.